Comparison of World, EU, the U. K., and US GDPs. We provide and compare the GDPs of leading world countries, and leading countries of the EU, with respect to that of the U. K.. We also compare the GDPs scaled by the value of goods in terms of dollars, or the Purchasing Power Parity (PPP) values. Since the PPP is scaled to dollars, the US GDP and PPP are always the same. We use mostly International Monetary Fund (IMF) data for 2015. 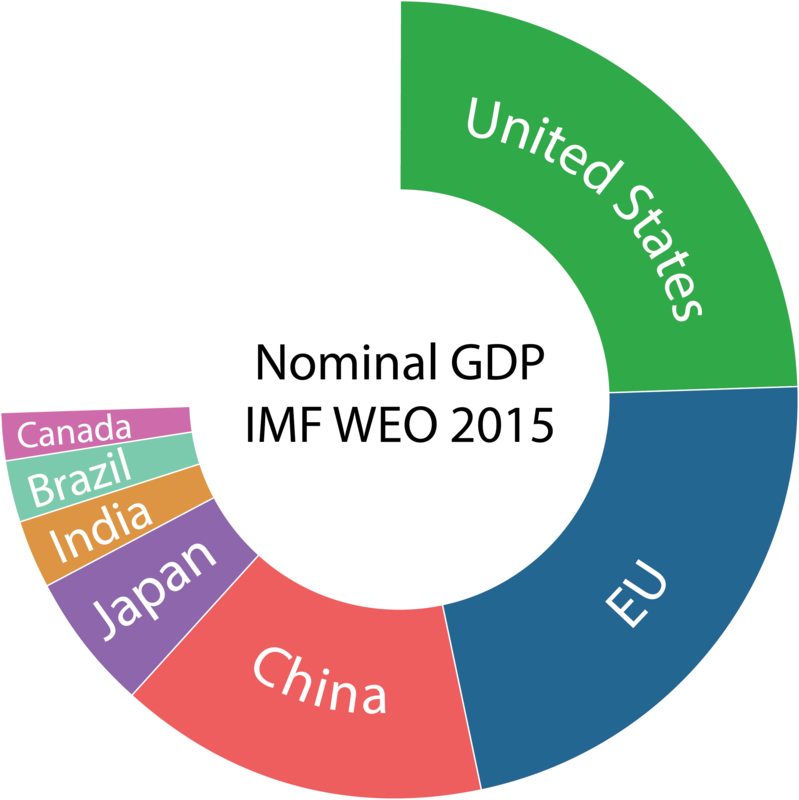 Starting at the top, the World’s GDP is $73.2 trillion (t). All numbers given are in trillion dollars. The top three entities are the US at $17.9, the EU at $17.0, and China at $11.0, but China has the largest PPP at $19.4. The next largest PPPs are India with $7.97 ($2.09 GDP), and Japan with $4.83 ($4.12 GDP). The next largest PPPs which are not in the EU, are Russia at $3.72 ($1.33 GDP), and Brazil at $3.19 ($1.78 GDP). A bagel chart of the World’s GDP contributions is taken from Wikipedia. Now we switch to the EU GDPs, which total $17.0. The largest is Germany at $3.36 ($3.84 PPP), then the UK at $2.85 ($2.68 PPP), France at $2.42 ($2.65 PPP), Italy at $1.82 ($2.17 PPP), and Spain at $1.20 ($1.62 PPP). The sum of the top 5 GDPs of the EU is $11.7 or 69% of the total. For the PPP, the top 5 EU total is $13.0. 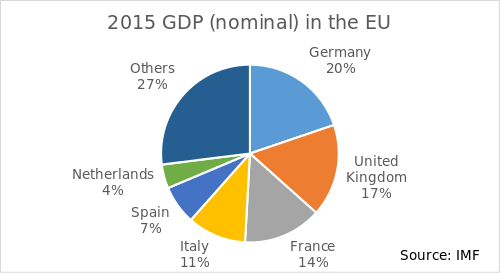 The percentage of EU GDP by the UK is 17%. A pie chart of the contributions to the EU GDP from the IMF is below. Since we are reporting from California, we show where this would fit if it were a country. California’s GDP and PPP are $2.42. In terms of GDP it would be tied for sixth with France. In terms of PPP it would be 11 th. Comparing its PPP to that of EU countries, it would be fourth. Of the US GDP of $17.9, California’s GDP is 13.5%, or about one seventh. Of US states, Texas is second with a GDP of $1.65, and New York is third with $1.44. This entry was posted in BRexit, Economies. Bookmark the permalink.